Scientists at Lawrence Berkeley National Laboratory, working with colleagues at the European Southern Observatory (ESO) and the University of Texas at Austin, have established that the extraordinarily bright and remarkably similar astronomical "standard candles" known as Type Ia supernovae do not explode in a perfectly spherical manner. Led by Lifan Wang, an astronomer and astrophysicist in Berkeley Lab's Physics Division, the researchers used the ESO's Very Large Telescope (VLT) in Chile to measure the polarization of light emitted by supernova 2001el as it brightened and dimmed. 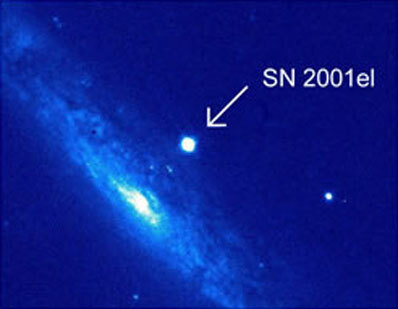 This is the first time the intrinsic polarization of a normal Type Ia supernova has been detected. The researchers were able to show that at peak brightness the exploding star was slightly flattened, with one axis shorter by about 10 percent. By a week later, however, the visible explosion was virtually spherical. "For the first time we have actually measured the asymmetry of a Type Ia supernova," says Wang. Not only can this information be used to test models of how Type Ia supernovae originate and explode, he says, it also helps to underline "how valid supernovae are for doing cosmology." It was by comparing the brightness and redshift of Type Ia supernovae that the international Supernova Cosmology Project, based at Berkeley Lab, discovered the accelerating expansion of the universe; confirmed by other researchers, their finding was announced in 1998. Accelerating expansion implies the existence of a "cosmological constant" or other form of so-called dark energy, now known to constitute some 75 percent of the density of the universe. Yet while Type Ia supernovae are by far the best standard candles for measuring cosmological distances, and hence for investigating dark energy, a small measurement uncertainty persists. "The asymmetry we have measured in SN 2001el is large enough to account for a large part of this intrinsic uncertainty," says Wang. "If all Type Ia supernovae are like this, it would account for a lot of the dispersion in brightness measurements. They may be even more uniform than we thought." The spectropolarimetry program led by Wang has previously established that other types of supernovae show considerably higher degrees of polarization, and therefore asphericity, than does Type Ia. Not only is the asphericity of Type Ia supernovae small by comparison, its effect on brightness measurements may be readily correctable. Wang and his colleagues use the example of a carton of eggs to explain how asymmetry can affect brightness measurements. All the eggs in the carton are similar, but the egg shape is only apparent when they are viewed from the side; viewed end-on, an egg looks round. Likewise, if supernovae are not spherically symmetric, they will shine more brightly in one direction than in others. Even with a telescope as powerful as the VLT, however, distant supernovae appear only as point-sources of light, so asymmetric shapes cannot be seen directly. Instead they must be inferred from the way the light is polarized. Polarization refers to the orientation of the plane of the electric wave component of light and other electromagnetic radiation. Polaroid sunglasses, for example, "measure" polarization by blocking or absorbing much of the light polarized by reflection from horizontal surfaces. In the light from a spherically symmetric star, however, all orientations are equally represented, and there is no net polarization. Not so for an asymmetric star or explosion. Light emitted along the longer axis shows a net excess of a particular polarization. "The differences are very small," says Dietrich Baade, a scientist with the European Southern Observatory and a member of the team that did the spectropolarimetry. "Measuring them requires an instrument that is very sensitive and very stable." To study SN 2001el, the team used the FORS1 spectropolarimetry instrument in conjunction with the VLT, the world's largest optical telescope array. They analyzed the polarization of various parts of the supernova's spectrum, beginning immediately after its discovery in September 2001. They made repeated measurements as the supernova grew brighter, reached maximum brightness, and then slowly faded. "Distance measurements of Type Ia supernovae have typically been calculated at maximum brightness," says Wang. "Our observations of SN 2001el show that asymmetry persists up to and beyond maximum brightness." As spherical symmetry begins to dominate, about a week after maximum, "it's not because the supernova is changing shape, but because we are seeing different layers of it," says Wang. Outer layers expanding at thousands of kilometers a second grow diffuse and become transparent, allowing the inner layers to become visible. "When it explodes, the outer part is aspherical, but as we see lower down, the dense inner core is spherical." The spectropolarimetry of SN 2001el suggests that information from the fading part of Type Ia supernovae light curves can be used to reduce uncertainties in the relation between their distance and brightness. Polarimetry also has much to say about a Type Ia supernova's progenitors and the way it burns when it explodes. The observations of SN 2001el provide evidence for the model in which a white dwarf star accretes material from an orbiting companion until it reaches the Chandrasekhar limit, a critical mass about 1.4 times the mass of our sun. To fully understand the resulting thermonuclear explosion it may be essential, as the spectropolarimetry of SN 2001el shows, to incorporate polarimetric data in three-dimensional models of the process. Typical one and two-dimensional computer modeling is inadequate. In addition to polarimetry, analyzing the spectrum of a Type Ia supernova during the rising part of its light curve can reveal specific information about its elemental composition. "This shows that we need to follow the rise and fall of the light curve completely," Wang says. In the future, very high-precision projects like the SuperNova/Acceleration Probe (SNAP) satellite, now under development, will insure that Type Ia supernovae are compared like to like, thus averaging out any asymmetries. SNAP is designed to find thousands of new supernovae and perform the sort of detailed studies of their light curves and spectra represented by the VLT's FORS1 spectropolarimetry of SN 2001el. What stands as an extraordinary achievement for a ground-based telescope will be standard operating procedure for SNAP.